Campbell Scientific Aust have announced the addition of the AVW200 vibrating-wire interface module to their Campbell range that will improve vibrating-wire measurements. Vibrating-wire technology is used in many sensors, including strain gauges, pressure transducers, piezometers, tilt meters, crack meters and load cells. These sensors benefit a variety of structural, hydrological, and geotechnical applications because of their stability, accuracy, and durability. A vibrating-wire sensor operates on the principle that a tensioned wire, when plucked, will vibrate at its resonant frequency. Physical changes to the sensor cause a change in the tension of the wire. An electromagnetic ‘plucking and pickup’ coil strums the wire. All frequencies, except for the resonant frequency, will die out in a short time (20 milliseconds). The wire will then continue to vibrate at the resonant frequency for some time. As it does so, it will cut the lines of flux in the plucking and pickup coil, inducing a voltage signal with the wire’s resonant frequency. The voltage signal is then picked up by the measurement instrument. However, this method suffers from external noise. As measuring these sensors involves low amplitude voltage levels, external electromagnetic noise can interfere and make it difficult to determine the resonant frequency of the sensor. If the external noise is bad, it can render the data useless. The AVW200 vibrating-wire interface module uses a built-in spectrum analyser to transform from the time-domain (time between pulses) to the frequency domain (pulses per second). There are two advantages in using the frequency domain. Signals can be separated into their relative frequencies and limits can be set on which frequency range is acceptable as a true signal frequency. 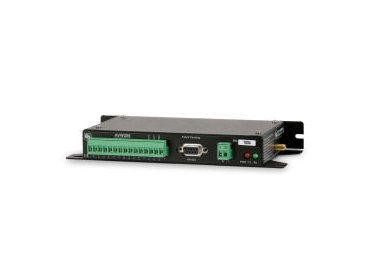 The AVW200 vibrating-wire interface module from Campbell Scientific Aust can be used through the SDI-12, RS-232, or PakBus network protocol. It has low power consumption (300 μA quiescent and 40mA active) and a rugged design along with the durability and long-term stability of vibrating-wire sensors. Wireless versions are also available, allowing for remote deployment of sensors from the data logger. Programming is easy with data retrieval by a single instruction. When coupled with the AM16/32B, the AVW200 vibrating-wire interface module can be used by any of the Campbell range of data loggers to measure up 32 single channel sensors, 16 single channel sensors with temperature compensation, or 16 dual channel sensors.